The word “conversion” means change, transformation, crossing over from point A to point B. Each conversion means something new. Point A to B. Then B to C. Then C to D.
When you hear the word “conversion” it’s often about someone changing faiths. Or at least from nothing to something. But I imagine conversion as a continual process of maturity. Maybe like going from Private to Corporal to Seageant. I’ve been converted several times, each time to a more mature faith. Each one authentic. But let me tell you what I mean. I grew up going to church and talking about this Jesus God-man. It was fascinating, threatening, sometimes boring, but also mind-stretching. One of my first conversion experiences was sitting in the pews at Knox Church in Bracebridge during Communion. The minister was saying these mystical words about Jesus body, blood, wine and sacrifice; and I remember thinking that nothing so far in my life was so compelling as this story of love poured out. Conversion. I remember rediscovering the Bible through the rugged lyrics of delta bluesman Son House. Conversion. Or learning about world religions in the great metropolis and feeling an undeniable kinship with the Son of Man. Conversion. Or talking with a drug addict in a boarding home in Toronto about the power only God can give. Conversion. Making promises before God with my wife on our wedding day. Conversion. Becoming members at St. Andrew’s in Toronto to profess and adhere to the apostolic faith alongside other sojourners. Conversion. Reading the Bible in the original languages of Greek and Hebrew for the first time. Conversion. Or on my knees in humbling desperation. Conversion. Or when Satan became more dramatically interested in my life. Conversion. Or prayerfully contemplating what it would mean to say “Yes” to my ordination vows. Conversion. Making myself a mission project for Jesus. Conversion. Baptising our children in the household of God. Conversion. Working as a pastor day in and day out and witnessing how God could let a sinner like me be a leader and still let me live. Conversion. Watching you live out your faith. Conversion. St. Francis spoke of having several conversion experiences—each one bringing him to a deeper understanding of God’s activity in his life. If you’re the same you you were last year is there a problem? To make a crude analogy, I was on a run this week listening to a Stone Temple Pilots song called Trippin on a Hole in a Paper Heart on my ipod. It was as if I had only heard the guitar solo previously on mono and was just hearing it now in stereo with the 2nd guitar for the first time. Rewind, rewind. I heard something new and exciting that wasn’t there before. Conversion. I try to convert to Jesus every day. 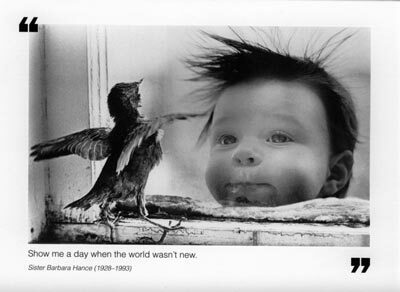 We have this picture (it gives no photo credit) of a wide-eyed kid looking at a bird with a quote from Sister Barbara Hance: “Show me a day when the world wasn’t new.” That’s conversion. No alcoholic ever quits for life. They give up drinking one day at a time. Then another day, then another. That’s faith. Totally dependent. Conversion today, then tomorrow, and again. Shuffling ahead one knee at a time. Thank you for these conversion thoughts. I had never thought about my experiences in this way, but it makes perfect sense to view conversion as an on-going process – kind of always reformed, always reforming. You’re so right! Most things in life worth doing have to be built upon, renewed, spruced up over time otherwise shabbiness and decay set in. What could be more important than refreshment in your faith to enhance your walk with God? Hi Lesley, I agree! Given that “time moves on,” a lack of self-renewal could actually be perceived as going backwards! It is the Holy Spirit who converts us and it is a great and powerful thing to realize in each conversion God is still at work in us in a marvellous way. Thanks Matthew for the reminder. Hi Calvin, thanks for the note. I hear you. I like the idea that God will not let us go. And not only that but continues to shape and prune and refine and sculpt us as life goes on. Hi Tony, I really like that. Interestingly enough, we had a similar discussion at the church last night with one of our groups who just finished a study on Timothy Keller’s Reason for God series. One person said that when we get too comfortable in life we reinforce the illusion that we can be independent of God—that we can go it alone because we seem to be doing “just fine.” But then something happens and we realize how dependent we are. So I would totally agree; trust is the key word!